Our Program consists of several, important things: An 11-Chapter eBook that provides everything you will ever need to quit and to quit for good. A cessation forum that is unique to anything you have ever seen on the web! You have to be a cessation program member to enter this part of the forum, but we have a very unique public forum also. The replacement of smokeless tobacco with Mint Snuff, a non-tobacco product manufactured by the Oregon Mint Snuff Company. 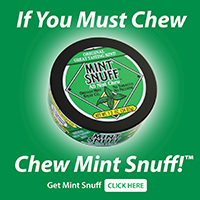 We recommend Mint Snuff by the Oregon Mint Snuff Company because it is clinically proven to help reduce the withdrawal pangs associated with tobacco cessation in the early stages. We are considered a low-intensity self-help intervention program as defined by Herbert H. Severson, PhD at the Oregon Institute in Eugene, Oregon and reported in the journal Nicotine and Tobacco Research. This research concluded that programs based on much less contact with the client than our program was very successful over quitting without a cessation program. Cost: $39.99 which includes the eBook, cessation program, and lifetime membership in the program. An exceptionally well done 8″x10″ booklet with good tie in to baseball. Great for all ages especially boys 10-18 yrs. Has information about the history of smokeless tobacco in baseball, the dangers of smokeless, and signs of nicotine addiction. It offers a nine step quit plan that is easy to follow and very informative. Photos: Many excellent photos of oral problems caused by smokeless tobacco and of distinguished ballplayers. An excellent source for professionals as well as older tobacco users. This full color 28 page booklet describes tobacco-induced and tobacco associated oral conditions, tobacco effects on clinical care, recommended oral examination methods and an excellent appendices with literature sources. Photos: Many excellent photos showing many oral health problems caused by tobacco. An excellent source for professionals as well as older tobacco users and parents of users. It covers the nature of smokeless tobacco (SLT) and patterns of use, oral mucosal lesions in SLT users, epidemiological evidence of SLT and cancer, nicotine and smokeless tobacco use, and the role of viral and other factors on SLT carcinogenisis. The booklet may be out of print but well worth searching for. Photos: Many excellent photos of oral conditions in color. To obtain: American Cancer Society-Professional Education Publication #3475-PE (1988) 33pgs. Another excellent source for professionals as well as older tobacco users and parents of users. Has answers to frequently asked questions regarding smokeless tobacco use; describes some of the campaigns started by the health services; covers the use of SLT and trends. To obtain: American Cancer Society- Professional Education Publication #3322-PE (1988) 24pgs. Photos: Many excellent color photos of oral cavity and others. One of the best resources for facts about the dangers of smokeless tobacco. Covers prevalence and trends of smokeless tobacco in the United States, Carcinogenesis associated with smokeless tobacco use, noncancerous and precancerous oral health effects associated with smokeless tobacco use, and facts on nicotine exposure. To obtain: Contact US Department of Health and Human Service, Public Health Service, Blair Building, Room 427, Bethesda, MD 20892-4200. Ask for NIH Publication No 86-2874.
by Arden Christen, DDS,MSD,MA and Jennifer Klein, RDH,MSAAn excellent resource book for anyone interested in oral health written by two of the most outstanding authorities in this field. Here’s and easy way to show your patients the effects of tobacco use on oral tissues. Describes the range of problems associated with both smoking and chewing tobacco, from bad breath, facial wrinkling and unsightly stains to dental abrasion, periodontal disease, hairy tongue, and oral cancer. Explaniations and detailed illustrations of the negative effects of tobacco use on periodontal and implant therapy are especially valuable. An appendix explains the benefits of cessation and offers solid suggestions. 33pp (softcover) 21 color illustrations.